If my most recent post looked at a book by my favourite male Korean writer, this one moves on to a work by perhaps his closest challenger. 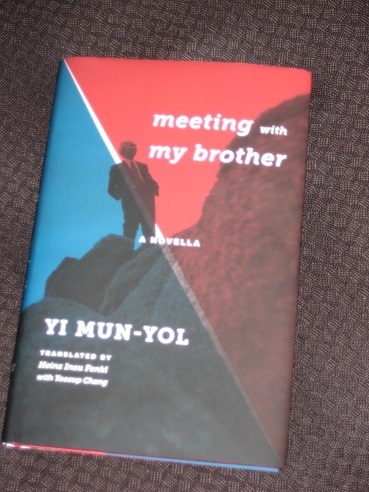 Yi Mun-yol is another of the big names in Korean literature, with several excellent books available in English (e.g. Our Twisted Hero, The Poet), and like Hwang Sok-yong, he’s not averse to casting an eye northwards. Today we’ll be looking at one of his more popular works, a brief tale taking a step back from the martial rhetoric and focusing on two men with more connecting them than blood ties. Meeting with My Brother (translated by Heinz Insu Fenkl with Yoosup Chang, review copy courtesy of Columbia University Press) is far from the first translation of this work into English; there was one by Suh Ji-moon in the Jimoondang series, and I read an online version a while back translated by Brother Anthony of Taizé. However, this is the first readily available commercial version in English, and the updated smoother read, along with an interesting introduction by the translator, makes this new edition well worth the effort. After initial hesitation, needing to get his head around the idea of this newfound family, Yi agrees to the meeting and waits for his half-brother to get in touch. To begin with, the meeting is anything but a heart-warming encounter, with a fair amount of suspicion in the air, particularly on the part of Yi’s brother. Gradually the walls start to come down, helped in part by the similarities in the two men’s appearance, helping them to acknowledge their blood ties. Yet their time together is painfully brief – needing weeks to discuss the events of the past decades, political realities mean they have just a few brief hours to express what they have to say. Meeting with my Brother is a wonderful novella, somehow managing to summarise the issues behind the nation’s division in less than a hundred pages. Yi skilfully weaves two main ideas together without either ever seeming out of place. One, of course, is the meeting between the brothers. The other takes a wider view, looking at the effects of the division and, more importantly, the possible political and economic effects of any potential Korean reunification. While the title focuses on his family issues, the meeting with his brother is far from the only important encounter Professor Yi has. Another member of the tour group the professor is a part of (many members of which appear to have an ulterior motive for their visit to the region…) is a ‘businessman’ with strong views on what might happen when the border comes down. He’s mainly concerned with the cost of feeding the Northerners, and is unconvinced that the ‘poor workers’ in the North will actually be willing to work hard under capitalism. His rather prejudiced views are reflected in the treatment related by a local Yanji café owner, whose stories of exploitation and abuse during her two years working in Seoul surprise the professor. Initially, we see him as an eccentric figure, but he’s perhaps most in tune with what’s at stake when the time comes to reintegrate the societies. He fears that in the process, those in the North will be the ones to suffer. “So, how are you all getting by?” I asked. I meant it simply as a friendly question, to show my concern for those who shared my blood, but for some reason this inquiry made my brother noticeably hostile. The look in his eyes suggested that he had been anticipating this turn all along. The younger brother continues with sarcastic replies, retorts about how hard life must be in the South for the Yankee lapdogs. It’s a telling reminder for Yi (and the reader) that life is actually possible in the Communist state. Slowly, the tension eases, and the two men are able to share stories from their past. We learn about the troubles and harassment Yi faced because of his father’s decision to live in the North, and it’s only now that he understands that, ironically, the same thing happened on the other side of the border. With their father under suspicion because of the family he left behind, the professors’ half-siblings have been unable to achieve their dreams, leaving Yi to reevaluate his hardships – and his beliefs. Of course, there’s more to the story than just the narrative, and in his introduction, Fenkl explains the autobiographical nature of the work (the plot basically mirrors the writer’s own experiences). His family background has meant that Yi Mun-yol has had to be careful over the course of his career, and his reputation is that of a fairly conservative author (unlike that of the fearless Hwang…). Another interesting point mentioned in the introduction is the extra scene added for this edition, showing the writer’s father heading north. The writer and translator believed this addition was necessary to help foreign readers to understand exactly what happened during the war, and why Yi’s father had to leave his family behind. Meeting with my Brother, quite apart from its political significance, is simply a beautiful, touching story, and it builds to the two brothers setting their differences aside to remember their father. There’s a sombre symbolism in the men from opposite sides of the DMZ gazing down at the landscape of the north, knowing that they’re unlikely ever to be able to walk it together. Yi shows that however much the two countries might want reunification, the difficult path towards it, and the costs involved, mean that it’s still a long, long way off. Thanks for this review–this book was my first foray into Korean literature, so I had no idea what to expect. I’m glad I wasn’t the only one who liked it! Elena – Glad you liked it 🙂 Funnily enough, this was one of my first Korean reads a few years back, and I think it’s a great place to start.